Hello. It's been a while. I'm happy to be back. The Other Placemat. Here's a situation of how lacking a deadline really affects getting something done. My Zig Zag Placemat tutorial was published in mid-September. I only finished one of the two placemats in time for publication. The second placemat was pieced in time, but not yet quilted. I finally quilted and finished it at my guild's retreat at the beginning of November. I'm not 100% pleased with the quilting, but it's done. And the wonky part in the middle will be covered by the plate. ;-) Happy to check off another item from the lengthy WIP list and I know the recipients will not be as picky as me about a little wonky quilting. I'm a member of the Santa Clara Valley Quilt Association and this was the first time I took part in one of their retreats. 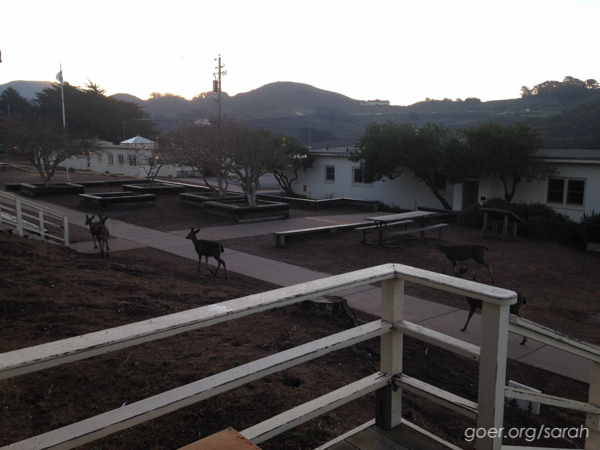 They do two annual Marin Headlands retreats (where we were) as well as in-town retreats at a local hotel. I highly encourage you to participate in a quilting retreat if you haven't done so yet. I've been a member of this guild on and off since 2002 and over the years I've met a few people from the group at guild events, and more recently through blogs and IG. But this event really changed how connected I feel to the group. (And I got so much done!) The 3-day retreat was a nice long time to get to talk about quilty and other stuff with some lovely women. I look forward to my next retreat! And here are a couple of the pictures I took at the retreat. Such a lovely area! Posted in Quilting. 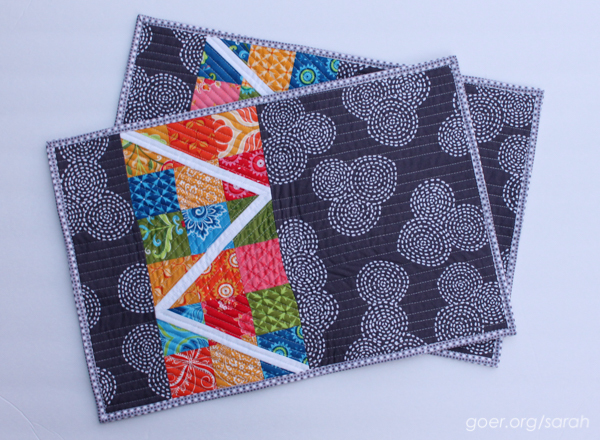 Tags: mini charm squares, mini quilt, placemat on November 29, 2015 by sarah. 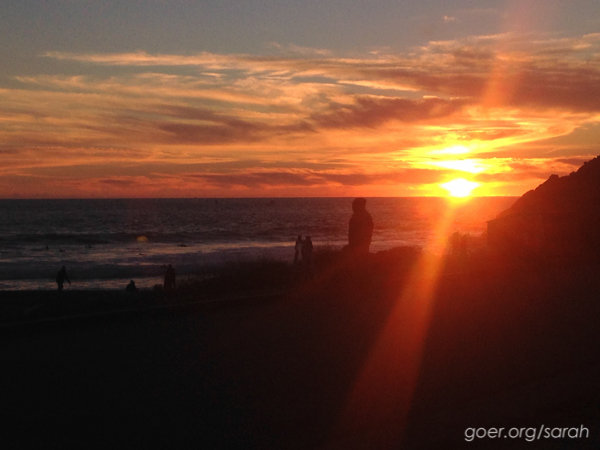 Was your retreat at Walker Ranch in Marin?? BTW, lovely new portrait of you, Sarah! We were at Nature Bridge, which is an Environmental Science Center. Thanks, Marji! My sister took those for me at the end of October. My hair had grown quite a bit, so I though it was time! Welcome back Sarah and congrats on finishing your other placemat! Your retreat looks picture perfect. I'm yet to participate in a retreat but hope to one day. Great new cover photo too! Thank you, Deb. Despite my absence on the blog, I've done a fair bit of sewing so I'm looking forward to sharing some other projects soon as well. Quilted placemats get a lot of use in our home, and the quilting that I thought was wonky at the time now has such a familiar pull and look to it that I know I will really miss these placemats when they have finally been washed one too many times (and that looks like it will be years from now). Congratulations for finishing an item off your list, and the retreat sounds like a wonderful time. I agree that getting time to be with other sewers is really special and worth making an effort to carve out of your schedule to do. Your placemats were an inspiration to me. I love what I've seen on your blog. Thanks for visiting, Yvonne. Your placemats are great. Sounds like you had a wonderful time at the retreat. I love having sew days, but looking forward to a weekend retreat some day. Thank you. I did have a great time. I think I'll have to skip the March retreat since I'm already going away for Quilt Con in February. It's too bad I'll have to wait until Fall for my next Marin retreat.